I couldn’t wait to read the book I have literally been waiting decades to read. When I read a book, I know it is great when I can picture the story as if I am watching a movie – what the characters look like, sound like, their personalities; the scenes and surroundings. I wanted to read it all in one sitting and I can’t wait for the next one to come out. The book kept me engaged and always wanting to know what was coming next. Having read the first book, I was very excited for the second. I was a bit impatient, but it was well worth the wait. The transition from first to second book was flawless. Don’t let the cover fool you! I write that first because I am not a fan of this style of cover art! 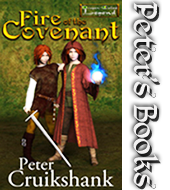 However, “Fire of the Covenant” is a very well written, traditional epic fantasy! 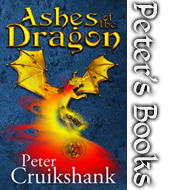 There is something in here for every reader of fantasy to enjoy – action, adventure, battles, magical creatures…even a smattering of romance. The novel is well structured, and moves at a good pace. The action scenes are engrossing and the dialogue convincing. What I want when I read a fantasy novel is to be transported from the hum drum world around me and entertained. If a book does this and I can visualise it as I read, then I am happy. “Fire of the Covenant” delivered all this! I look forward to the sequel. I couldn’t wait for the 2nd book to come out and it did not disappoint!! There were some surprising twists that were outstanding. It is seldom that I am shocked by a story line as you can usually guess what is going to happen. But I have to say that this book really kept me on my toes. It was vivid and had a great plot. I can’t wait for the third one. 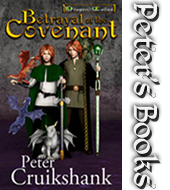 The author did an incredible and amazing job of really bringing you into the realm of the twins.